and allowed to run on gov-ernment lands for two years. The change of climateand the sweet grass of the North increases their sizeand quality. 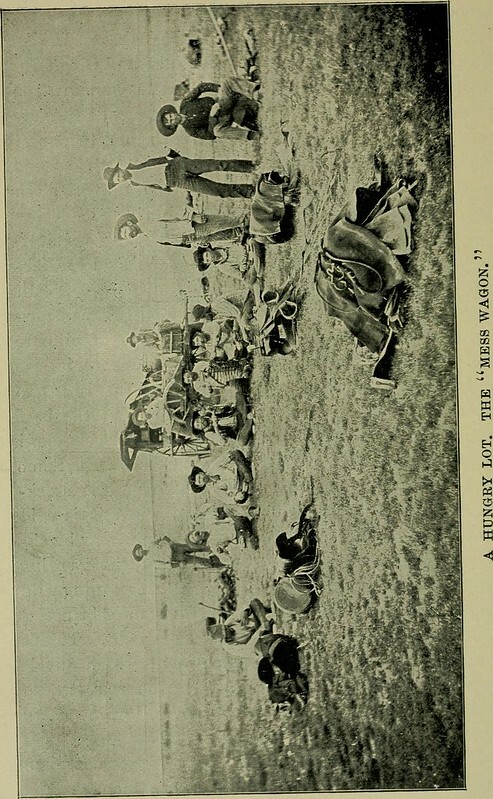 Western rangers are now furnishing tothe Chicago market during the fall most of the beefand export cattle used here. Seventy-five per cent of allthe range cattle come to the Union Stockyards. Someidea of the close relations existing between the stock-yards and the ranch may be formed when it is saidthat nearly $15,000,000 are advanced in a year by thelive stock commissioners at Chicago on the growingcrop of fall steers,yearlings, etc., which are running wildand getting fat in unconscious anticipation of bringinggood prices and paying off their ownersdebt. This isa mild form of the great mortgage evil which envel-oped the planters of the South before the war, whosecotton crops were mortgaged to their full value everyyear before the crop was ripe. However, the conditions existing at the present timein the cattle business are favorable for a boom. Image published by Internet Archive Book Images on 2014-07-28 14:48:53 and used under Creative Commons license.